Mr. Braden welcomes your constructive comments and educational questions. 40-plus years in the classroom is not enough. Where else is so much fun to be had? Warping young minds is only the beginning of their learning to make the best decisions. • English teacher Don Braden has worn a tuxedo to class on the first day of school for several years. It’s a tradition that the Barstow High School teacher has become known for. Vinney Williams, yearbook and audio/visual teacher, thinks Braden is setting the tone for the rest of the year. 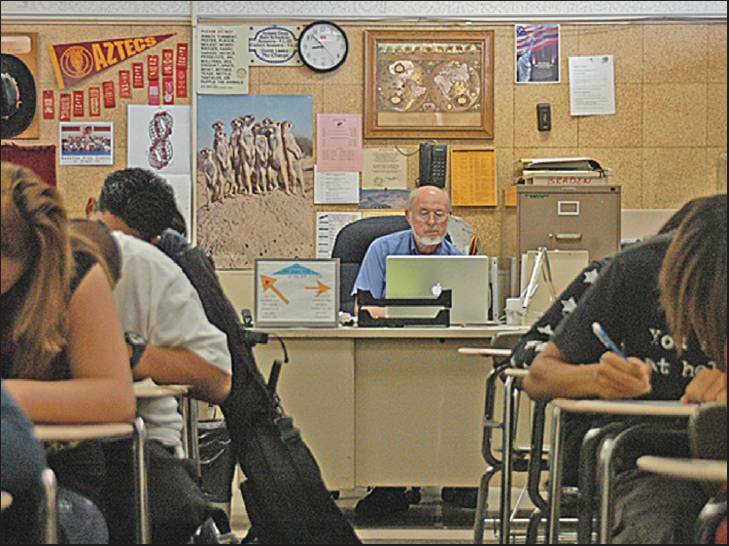 As the high school closes out its last day before summer vacation Wednesday [today], Braden will end his 45 years of teaching in the Barstow Unified School District. According to history teacher Dwight Anders, a colleague of 23 years, Braden will leave an indelible mark on the high school. “He’s played an important part of the school ever since I’ve been here,” Anders said. Dittman muddled through the essay, which aimed to get the students thinking in more abstract and philosophical terms. Braden acknowledged that sometimes he tosses out ideas that go a little over his students’ heads. But that gives them a chance to learn something new, he said. “They have to do something they haven’t done before,” Braden said. The 15-year-old found herself becoming interested in real life topics she had never cared about before, like global warming. “It was almost a mixture of class and life itself,” she said. Braden started in the district at then-Kennedy High School in 1964 as a Latin teacher. 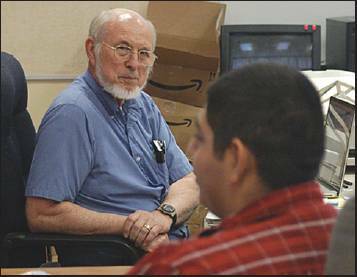 When the two high schools merged, Braden taught 12th-grade English and has been the department chairman a total of 19 of his 45 years. He’s also coached some combination of track and cross country for almost 30 years. According to Associate Principal Scott Godfrey, Braden has profoundly shaped the English curriculum and has been a campus leader. “That’s going to be a void for us as a staff,” said Godfrey. At times, Braden has been a force to be reckoned with. Anders said years ago, he and Braden, who have opposite political views, were engaged in a heated debate in the teacher’s lounge that got so intense that a new teacher reported a fight. “He’s not shy about telling you how he feels about things,” said Anders, who added that they haven’t let their differences get in the way and have simply agreed to disagree. As school ends, Braden will pack up his longtime second home, room 71. Life has revolved around teaching and students, said Braden, and upon retiring he and his wife plan to visit their two grown children (both teachers) and do some traveling. Braden will also be focusing on getting his second novel, a science-fiction book, published.